The music industry was never ready for this week’s Cool Kid and hit maker, Thabo ‘Tboy’ Moagi, and he is here to take South Africa by storm. The third-year Bachelor of Medicine student is not only smart but possesses remarkable talent in music production as well as DJ’ing. Last year, Moagi shook South Africa after releasing a political gqom song titled ‘Ubaba ka Duduzane’, which gained popularity on Twitter and spread like wildfire. Moagi, who started producing music at the age of 12, did not get professional training for his skills. The hitmaker observed his brother produce music on their computer at home and ended up learning from him. “I’ve been working on music since 2009, and focused on hip hop,” he said. After meeting friends from Durban during his first year at Wits, Moagi was introduced to a music genre that would heighten his music career. “My friends introduced me to the Durban sound, gqom. It was becoming popular and I learnt how to do it, which is how I produced and released my first single last year September called ‘Ubaba ka Duduzane’. It became a hit,” exclaimed the 21-year-old. According to the rising music producer, ‘Ubaba ka Duduzane’ is political gqom, a genre that he created.It consists of a combination of hilarious moments in parliament and gqom beats. “I took clips from parliament where those words (Ubaba ka Duduzane) were said and made a song out of that. Three months later, it had over 1.4 million views on YouTube,” Moagi said with awe. The popularity gained by his first hit single has motivated him to work on more music. He has performed at over 10 gigs around Gauteng and is now working with Sho Majozi, on her new album. Moagi plans to complete his studies while furthering his career in music with more hits. 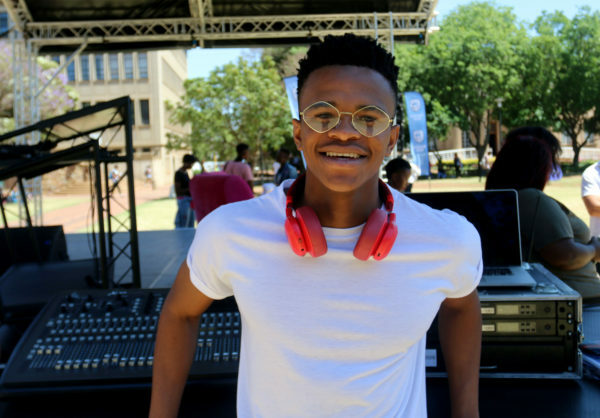 Wits Vuvuzela: Cool Kid: Andisiwe ‘Andy’ Mpinda. September 22, 2018. Wits Vuvuzela: Cool Kid: Simphiwe Blom. August 25, 2018. Wits Vuvuzela: Cool Kid: Wits rugby’s Mexican addition. August 19, 2018.